Kids and parents alike were delighted with the arrival of top kids’ fashion brands, all brought to the Philippines by Internationale Globale Marques (IGM), an affiliate of Richwell Phils. Group of Companies, the leading distributor, manufacturer, and licensor of branded children’s products in the country. To see the highlights of the fashion show, click CONTINUE READING and smile! “Nautica, Desigual, and ELLE kids arrive in the Philippines each carrying a distinct style which kids of all ages can relate to. IGM is proud to bring these three top global kids’ fashion brands in the country and we hope that these brands can be part of kids’ journeys as they explore fashion and build their own style personality,” said IGM Chief Operating Officer Maye Yao Co Say. Guests got a first-hand look at the brands’ choice pieces with the product displays, which also featured elements that told each brand’s style story. Nautica’s beachside theme captured its love for adventure and the outdoors, including a sailboat on display. Desigual exhibited its eclectic charm with a wall filled with quirky artworks that speak of its creative vibe. ELLE kids embodied the spirit of Paris with a model Eiffel Tower, which took guests right into the heart of the city that serves as the brand’s style inspiration. Each brand’s unique personality extended to the fashion show where the three brands paraded their latest collections. Nautica Kids opened the show with its laidback approach to fashion that oozed with the brand’s penchant for exploration and adventure. Casual pieces for both adventurous boys and girls ruled the ramp for the American brand. The collection also resonated with nautical elements in its polos, tops, dresses, outerwear, and jeans, which boasted of the classic, crisp, and clean lines Nautica is known for. Opening the show was Nautica kids, known for being easy-going and fun oozed the runway with the brand’s penchant for exploration and adventure. Quirky and eclectic distinguished Desigual’s collection. The Spanish brand, which became popular with its offbeat approach to casual clothing, presented its kids wear with humor-filled prints, patchwork designs, and innovative artwork. With its spontaneous and creative character, Desigual is the right brand for decisive and free-spirited little ones. The colorful and quirky Desigual kids is perfect for the free-spirited and versatile child, ready to flaunt their artistic appeal. 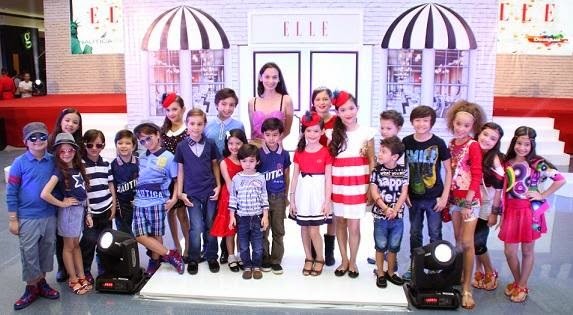 ELLE kids ended the show on a classy note with items that exuded the easy and effortless sophistication of its Parisian roots. Kid models sashayed down the catwalk in prim and polished pieces from pretty tops and dainty dresses for girls, and refined polos for boys. The collection also included footwear rendered in playful yet elegant styles. The line-up captured the personality of the ELLE kid: chic, classy, and confident. Elegant, sassy and classy, ELLE kids closed the show with the effortless charm they carry from its Parisian roots. Amina Aranaz-Alunan, whose kids also serve as ambassadors for the brands, is all praises for Nautica, Desigual, and ELLE’s collections and how they all speak about her kids’ style personalities. She shares, “My eldest Lucas is big on the outdoors and adventure so he prefers Nautica’s items. 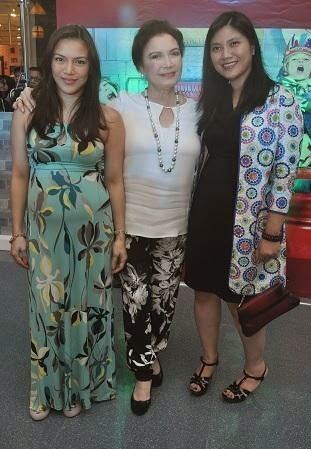 Amina Aranaz-Alunan with her children and brand ambassadors (L-R) Helena for ELLE, Diego for Desigual and Lucas for Nautica kids. The event also featured a special segment wherein kids of Manila’s chic and stylish set sashayed down the catwalk clad in key items from Nautica, Desigual, and ELLE. 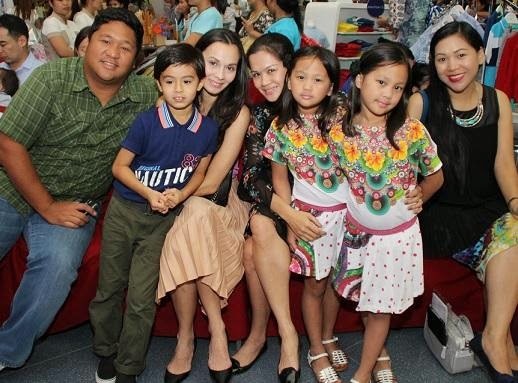 Spotted supporting the kids in the fashion show were Helen Gamboa-Sotto, Ciara Sotto-Oconer, Joy and Gian Sotto, Mark and Loralee Soong, Dino Aldeguer and Michelle Teves, Vic and Roslyn Gelano, Jondi and Jocel Buensalido, Sharon Lopez, and Cora Tanjuatco. Ciara Sotto-O’Coner and Helen Gamboa-Sotto arrived in full support for their family alongside IGM’s Chief Operating Officer, Maye Yao Co Say. (Top L-R) Gian and Joy Sotto with children (bottom L-R) Edrigo, Sandro, Rossano and Hugo. (L-R) Mike Soong, Lucas Alunan, Amina Alunan, Loralee Soong, twins Gabrielle and Noelle Soong and Jocel Buensalido. Wearing ELLE kids’ notable classy dresses were playmates (L-R) Natalia Aldeguer, brand ambassador Helena Alunan, Lucia Gelano and Sofia Gelano. ELLE, Desigual and Nautica Kids are available at leading department stores nationwide. Log on at IGMkidshub facebook page and www.igm-ph.com for the latest updates.